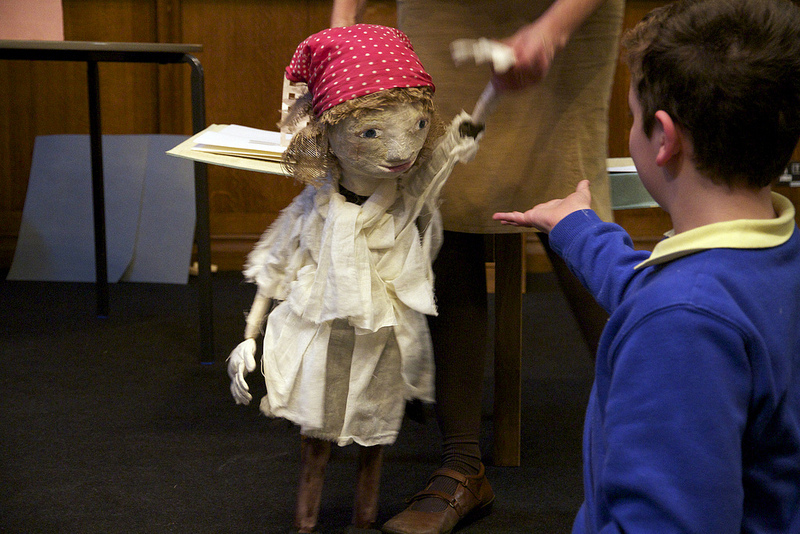 The performance includes puppetry, storytelling, multi-sensory props/costume, live music and lots of participation. As we developed ‘Welcome to Cottonopolis’ with 3 cultural venues in Manchester – we decided to give the story a historical setting so that there were clear links to the various venues’ collections. Manchester was nicknamed ‘Cottonopolis’ during the industrial revolution. Manchester was the first industrialised city in the world and prospered through the textile industry. Set in Manchester during the reign of Queen Victoria (mid 19th century), the performance tells the story of Bertie and Lily. Bertie loves to read, particularly books about dragons. 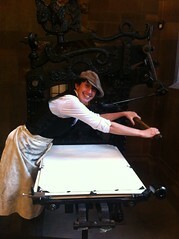 Lily doesn’t go to school, she works in the mill. Every day Bertie has to go past the mill to get to school. The mill… where the fires are hot, the smoke and dust choke him and the mill machines are loud. Bertie is convinced that there is a dragon in the mill and he just can’t go by… even if his teacher will get cross, his mother will worry and his clothes will get dirty. Can Lily help him? We were mentored by the Horse and Bamboo Theatre for the puppetry and performance and the Research Institute for Health and Social Care, Manchester Metropolitan University were involved in development and evaluation. To devise the performance, we ran creative workshops with three groups of young people with SEN. These were invaluable as they tried out a wide variety of applied theatre techniques and styles. The workshops were delivered in the young people’s schools and at each of the cultural venues which enabled us to explore how the pupils responded to the gallery collections and stories. 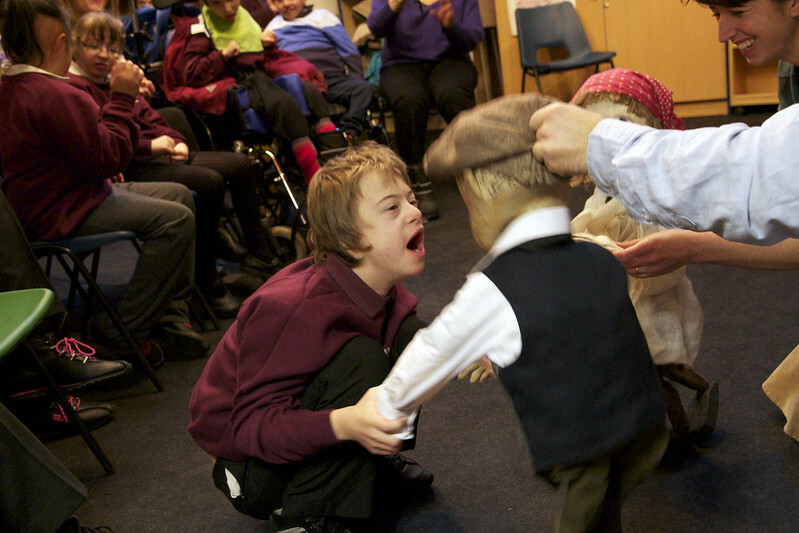 Every group received an outreach visit to their school before the performance to enable them to meet one of the performers and a puppet, and to introduce the story and historical context (where appropriate). Pupils were aged between 6 and 16 and had a wide range of SEN including ASD, sensory impairment and PMLD. 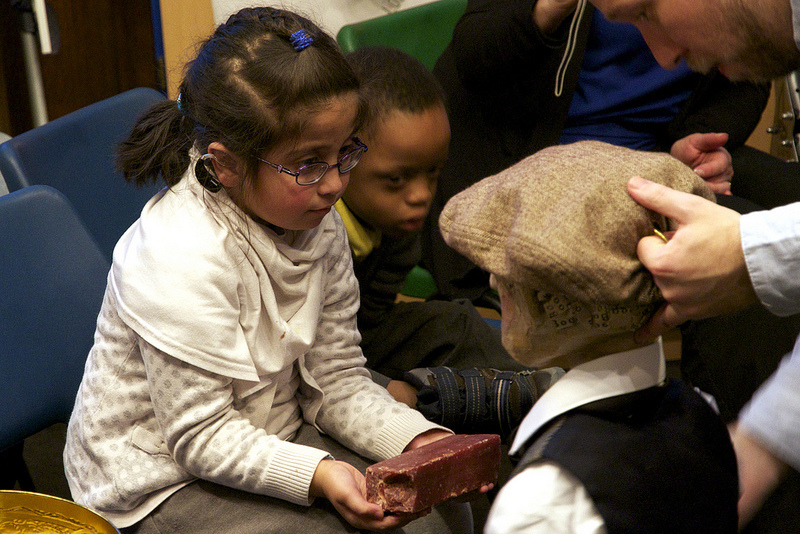 Following the successful engagement of children and young people through ‘Welcome to Cottonopolis’, The John Rylands Library have commissioned Peoplescape Theatre to devise a multi-sensory tour which incorporates participatory theatre techniques for adults and young people. The resulting session is to be delivered by in-house staff and the process will include a devising workshop with staff and training.